These are my compiled MODs for pimping up my 42056 Porsche 911 GT3 RS. - Includes free 315 pages PDF with step-by-step building instructions. - You will need 283 additional parts to the original set 42056-1. 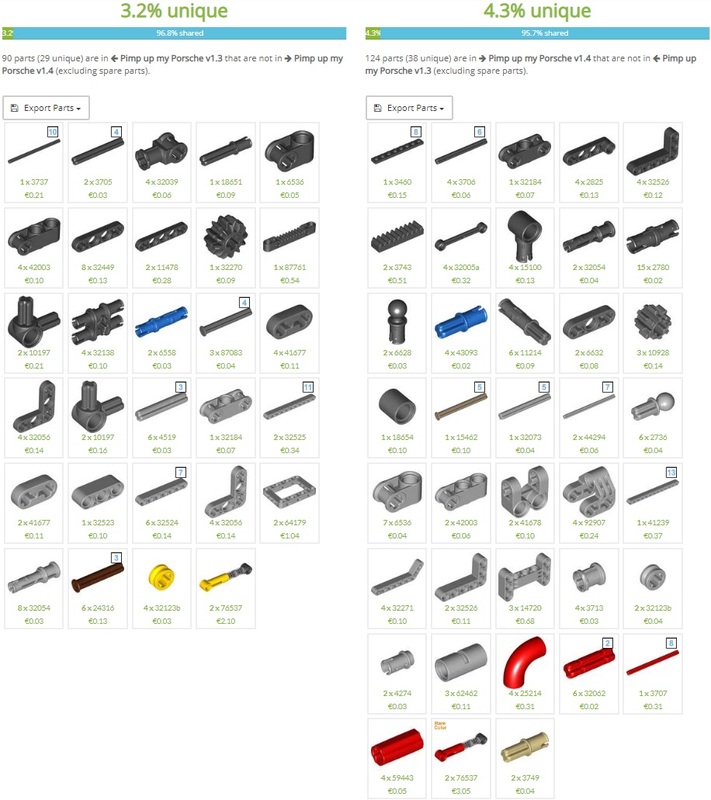 Use rebrickable's compare feature to see which parts you need. Now improved with new front and rear axles with anti-roll bar (see change log)! I started with adding all changes from Didumos Unofficial Errata. - This compilation contains some really cool changes and optimizations from the Lego community. I took some ideas from Didumos69 Ultimately playable Porsche. - Additional shock absorber and improved ground clearance for front axle => Very good idea for playability! - working doorlocks based on the design of el Squatter and optimized by myself. - Thank to Didumos who inspired me with his Improved PDK shifter. He used blue 1/2 pins to guide the yellow knob gears in exactly the right position for a smooth movement during shifting. This is much better than the original design. - I combined Didumos' geometry while keeping most of the original design and the easy to mount rubber bands on top. - Improved front and rear axles with anti-roll bar based on the design of DayWalker (works and looks really cool!). Have fun to pimp up your Porsche, if you like! I really like the door locks on this MOD. Orange if one of my favorite Technic colors and I've been collecting a lot of parts to build all the excellent MOC's on Rebrickable recently.